DI Meg Dalton isn’t prepared for her latest case. A ten-year-old girl is found running through the woods, barefoot and wearing only a blood-soaked nightdress. She has no memory of what happened to her, but her father is found stabbed to death in their nearby house. At first Meg blames an intruder – but why had the girl’s murdered father been so obsessed with the creepy statues in the woods, and with the girl’s recent heart transplant? Meg’s investigation leads her down a chilling path. The girl has been having nightmares, and seems to remember things that happened to her heart donor. Who was the heart donor and what happened to them? Could this have anything to do with the murder of the girl’s father? Dead Man’s Daughter drew me in immediately. 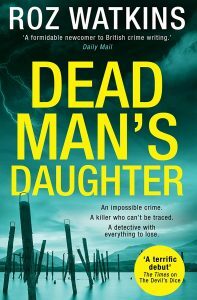 This is the second novel from Roz Watkins in her excellent DI Meg Dalton crime series, and it did not disappoint. In fact, it exceeded my expectations. It’s an intelligent and thought-provoking story that kept me guessing all the way through. A dead father, his young daughter found covered in blood, creepy statues, a figure with its heart carved out, heart transplants and cellular memory – are just a few of the elements in this fast-paced novel that appealed to me! I liked the use of Meg’s backstory, which gives her a unique insight and empathy. We’re given just enough of her personal life to worry about her and it’s cleverly woven into the plot. The outcome of this story went far beyond all my predictions in an incredibly powerful and unforgettable way.